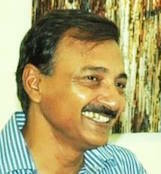 Sukanta Dasgupta was born in 1963 in Gaya, Bihar. In 2012 and 2014 he exhibited solo at Darpan Art Gallery, Pune. In 2013 he had solo shows at Kala Academy, Goa; at Institute of Interior Designers, Pune and at Nehru Centre Art Gallery, Mumbai. In 2015 he showcased solo at Bliss Art Gallery, Pune. In 2015 he exhibited solo at Lalit Kala Academy, New Delhi. In 2016 he had solo exhibitions at AIFACS; Triveni Kala Sangam and at the India International Center, New Delhi. In 2017 he participated in The Winter Sale at Gallery 7, Kalaghoda in Mumbai. Sukanta lives and works in Pune.